31st May 2017 update: There is a new event planned for weekend of 17th and 18th June. Operation Anthropoid was the code name for the assassination of Schutzstaffel (SS)-Obergruppenführer and General der Polizei Reinhard Heydrich, head of the Reichssicherheitshauptamt (Reich Main Security Office, RSHA), the combined security services of Nazi Germany, and acting Reichsprotektor of the Protectorate of Bohemia and Moravia. 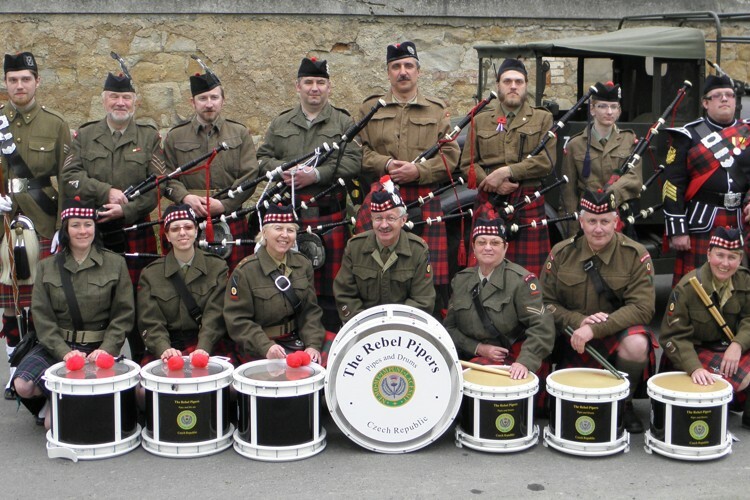 The operation was performed in Prague on 27 May 1942 after having been prepared by the British Special Operations Executive with the approval of the Czechoslovak government-in-exile. Wounded in the attack, Heydrich died of his injuries on 4 June 1942. His death led to a wave of merciless reprisals by German SS troops, including the destruction of villages and the killing of civilians. Anthropoid was the only successful assassination of a senior Nazi leader during World War II. 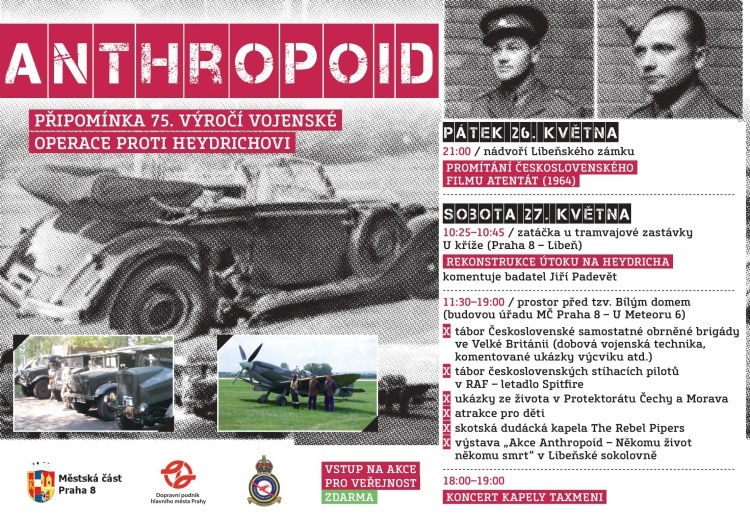 Saturday 27th May 2017 is the 75th Anniversary of Operation Anthropoid and a whole day of events is planned in the Prague 8 district. All events are free. Gabčíkova 1224/4 (nearest tram looks like Vychovatelna which is on the 24 route. It’s about a 30 minute walk to the next venue (Tram stop U kříže). The 24 goes there but could be diverted because of the event. Nearest metro, I think is Palmovka and then a 10 minute walk. The original location has been redeveloped, so the reconstruction will happen at the tram stop U kříže, which is similar to the original. 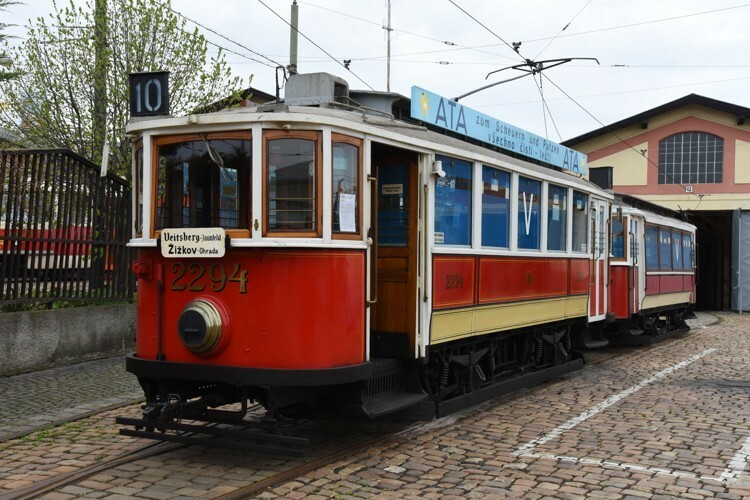 There will be some vintage trams and other vehicles to add authenticity. Reconstruction of street scenes of occupied Prague. Streets and buildings will be themed; posters, tailors shop, newsagent, post-raid civil defence office of auxiliary of the German Red Cross. May 26th at 21:00: There is also a free screening of the Czech movie ATENTÁT (1964, director Jiří Sequens) in the courtyard of Libeňského zámku, projekce Kinobusu Dopravního podniku – although I’d guess only in Czech and without subtitles.